Reefer load volumes continued to drop seasonally, especially in Southern California. Reefer prices are also lower than they were in June, but that’s normal for this time of year. The good news is it’s happening slower than it did in 2015. Below is a look at some of the biggest price changes for spot market reefer freight last week. All rates include fuel surcharges and are based on real transactions between carriers and brokers. Chicago reefer volumes have been building up for a while, and outbound rates finally started to improve last week. Rates are still falling out of Florida, and California prices have also started tapering off. Jul 17 – 23 vs.
Jul 10 – 16 Jun 2016 vs.
May 2016 Jun 2016 vs.
Jul 17 – 23 – Spot market demand and rates drifted down again last week for vans and reefers, a typical trend for mid-July. Flatbed rates edged up, however, compared to the previous week. More than 250,000 drivers have installed the DAT Trucker mobile app for iPhone and Android. The free trucker app provides drivers with all the services they need while on the road. Owner operators and carriers can access a limited number of nearby DAT Extended Network loads and get other community resources. Download the free trucker services app now! Jul 10 – 16 vs.
Jul 3 – 9 Jun 2016 vs.
Jul 10 – 16 – Spot market demand and rates typically fall after July 4th, but that decline came a little later than usual this year. 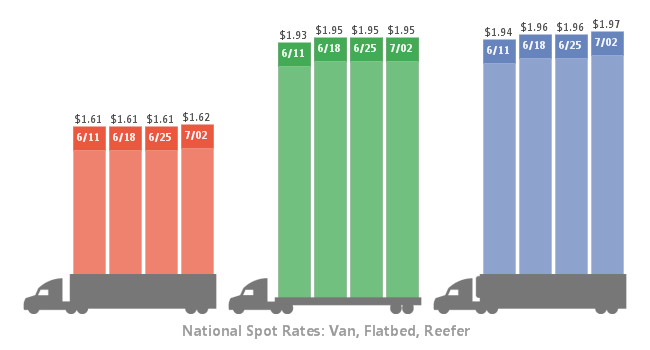 National average spot market rates for vans and reefers declined 4¢ per mile, after hitting their highest marks of the year in the previous week. Flatbed rates added 4¢. Where can I find more loads. The Panama Canal opened a new lane for larger ships this week, and East Coast ports have been expanding efforts to attract Asian imports that would otherwise arrive on the West Coast. The canal expansion has run into plenty of obstacles along the way, and many East Coast ports still aren’t ready to accommodate the larger ships. Expansion at the Panama Canal, pictured above, has led to a business boom in South Carolina. Photo by Stan Shebs. But the South Carolina freight market has already gotten a boost thanks to the expansion, and the industrial boom has been evident on DAT Load Boards. Greenville, SC, rose to 11th place for the number of van load posts last year, and its average load-to-truck ratio in 2015 was higher than any other “top 30” market. Last week’s load-to-truck ratio in Greenville rose to 7.4, well above the national average of 2.7 loads per truck. Warehouses and industrial parks continue to grow in and around Greenville and Spartanburg, according to the Wall Street Journal, and more goods are expected to arrive from the Port of Charleston, some 200 miles away. Cities from the Gulf Coast to New York are also trying to lure more Asian imports once the canal opens. Economists and developers say the Upstate’s low labor costs and acres of cheap, undeveloped land, give the region an edge. They also cite its manufacturing base, as the auto industry draws suppliers to locate closer to factories, and growing auto exports require bigger ocean vessels to reach customers around the world. The rates are also trending up. The top outbound lane from Greenville is a short hop over to Atlanta. That lane paid an average of $3.09 per mile last week, which is 20¢ higher than it was a month ago. Most drivers spend 3 to 4 hours waiting to get loaded or unloaded, according to a DAT survey of 257 carriers and owner-operators. Of the carriers surveyed, 54% of them said they had to wait between 3 to 5 hours every time they’re at a shipper’s dock. Another 9% said that they wait more than 5 hours on average. You don’t have to crunch a lot of numbers to figure out how that’s bad for business. Detention fees usually range from $30 to $50 an hour after the driver has been detained for more than two hours, based on responses those same carriers plus 50 brokers who were also surveyed. And that’s if the carrier is actually lucky enough to collect a detention fee. Two-thirds of the brokers said that they only paid detention when they were able to collect a fee from the shipper or consignee. When a broker is able to collect from the shipper, they were twice as likely to pay detention fees to the carrier. But those fees are just a drop in the bucket compared to how much that detention time actually costs trucking companies. 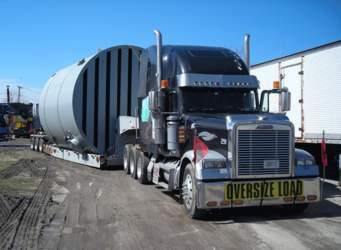 One owner-operator cited a $1,900 loss due to two loads he was unable to accept because of a lengthy detention at a receiver’s dock. Jul 3 – 9 vs.
Jun 26 – Jul 2 Jun 2016 vs.
Do you have shipper customers who need to move more freight than you can service with the current size of your fleet? You could buy more trucks to move that extra freight, but adding a brokerage is another option. If you already have relationships with shippers, know their lanes, and know the capacity that they need, then brokering their freight could add another source of revenue for your transportation business. There are 6 steps you’ll need to take before you can start brokering freight. You’ll have to apply for broker authority through the United Registration System. This will be separate from your carrier authority. You’ll also need to decide how to organize this separate company: sole proprietorship, partnership, LLC, S corp., etc. Getting your broker authority means you have to designate process agents in every state you’re doing business, just like you did to get your carrier authority. Our fleet services team can help with all the paperwork. 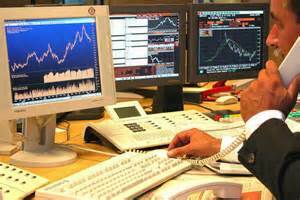 Every freight broker has to have a $75,000 surety bond or trust fund. It’s similar to the liability insurance required for your trucks, and it’s there to ensure that a carrier can get paid if a broker doesn’t fulfill a contract. The bond covers the entire brokering side of your business. DAT customers can get a broker bond at a special price. Some states require extra permits to set up your business, so be sure to check the requirements in your state. DAT Fleet Services can help with that too. Managing your cash flow is key to your brokerage’s success. You’re already familiar with days-to-pay – the number of days a broker has to pay the carrier – but as a broker, you won’t always get money from the shipper before you have to pay the carrier. TMS software like DAT Keypoint is the easiest way to manage your transactions, keep records, and manage the company’s cash flow. TMS software also lets you manage all your new brokerage’s operations in one place, so you can move more freight with a smaller back-office staff. A streamlined, entry-level TMS like DAT Keypoint Ops requires minimal training and lets you control all your operations on one screen. You can also upgrade it seamlessly to fit your business needs as your company grows. Are you going to be the one working the phones, or will you need new employees? Would you be better off working with independent agents? Will your brokerage share the same office space as your carrier business? When you started your carrier business, most of the startup costs were tied to equipment. For a brokerage, some of those costs are a lot less obvious – contingent cargo insurance policies, for example. Meet with a business attorney who has experience with brokers. That will save you some headaches. DAT can help get your brokerage off and running, whether that means getting your broker authority or streamlining your business with broker TMS software. Call 800.551.8847 for more info. Jun 26 – Jul 2 vs.
Jun 19 – 25 Jun 2016 vs.
Jun 26 – Jul 2 – Shippers rushed to move van and reefer loads before the end of the second quarter and the start of the July 4th weekend. Spot market rates rose for vans and reefers, but flatbed rates held steady for a third consecutive week.